Magnesium taurate is touted as an ideal supplement to treat magnesium deficiency. Magnesium deficiency is thought to exacerbate hormonal pain, headaches, diabetes and heart problems, while taurate is a compound naturally found in your stomach bile, which aids the breakdown of material you ingest. The combination of magnesium and taurate is thought to help speed absorption of magnesium and allows a more stable form of magnesium to be ingested without other impurities. You should only take magnesium taurate after talking to your doctor about the possible complications you may experience. 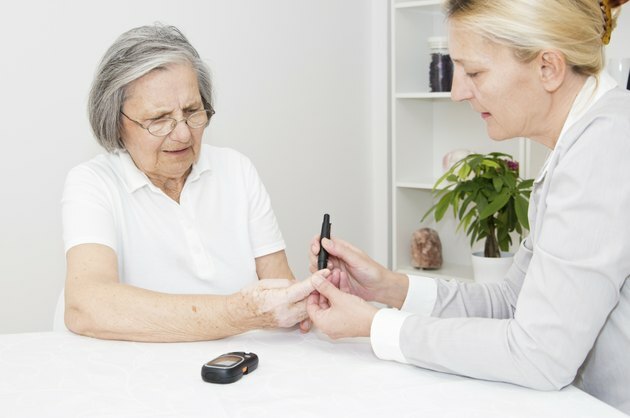 Although magnesium taurate might improve insulin-resistance diabetes, diabetics who take additional insulin may find their blood sugar levels more difficult to control while taking magnesium taurate. A report published in “Medical Hypothesis” in 1996 indicates that administering patients with magnesium taurate made them more responsive to insulin. If you are self-administering magnesium taurate as a diabetic, you may inadvertently create enormous fluctuations in your blood sugar levels. These fluctuations may be severe and result in stroke-like symptoms. You should only take magnesium taurate under the direct supervision of your doctor. If you have an undiagnosed blood sugar problem, you may experience a sense of jitteriness or confusion. You should seek help quickly if any of these symptoms occur. The most common side effect of excess magnesium in your system is chronic diarrhea, according to Drugs.com. However, you would have to consume a large dose of magnesium taurate daily in order to experience this problem. A common complication of chronic diarrhea is dehydration. If you are experiencing chronic diarrhea, ensure that you are drinking plenty of fluids and consult your physician. Diarrhea may also be a sign of other intolerances, such as gluten or lactose. This may become a problem if you are using a supplement that contains impurities. Since the Food and Drug Administration does not control supplements, the supplement manufacture may not even mention the possibility of these impurities. A rare side effect of excess magnesium in your system is muscle paralysis and trouble breathing, according to the May 2003 issue of "The Clinical Biochemist Review." Accumulation of magnesium in your system may collect in nerve fibers and prevent communication between your nerves and muscles. This is a serious side effect that lowers your rate of respiration. If you notice any numbness or tingling, these may be early signs of a magnesium overdose. Seek medical help immediately to treat these symptoms.